Maree and Mandy have teamed up to bring a fun and unique element into dog training and to share their passion for animal welfare, the environment and thinking outside the box! This 5 week program is designed to combine basic obedience training and stand up paddle boarding skills. We will teach you and your dog basic cue commands relevant to stand up paddle boarding progressing each week towards improving communication, balance and group team-work. You will learn to identify potential safety hazards on the water when launching, dismounting and during your paddle. 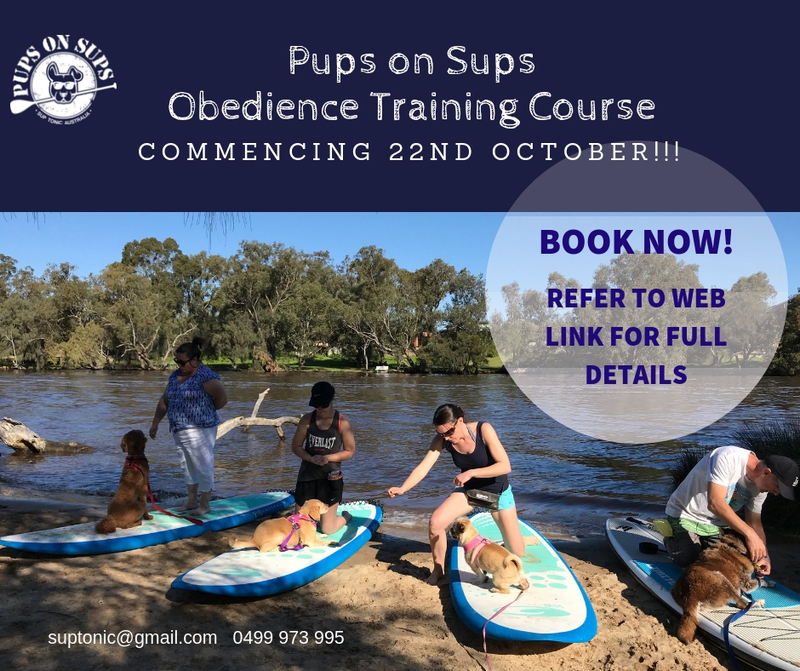 Qualified SUP instructor and experienced dog trainer currently running training classes for puppies, adolescents, and adult dogs. Mandy has been working with people and their dogs for 18 years and is certified and experienced in Animal Care, Urban Animal Management (Canine/Feline Sociology), Kennel/Cattery Management, and Veterinary Nursing. Mandy has been helping people train their puppies and dogs in select veterinary clinics and dog training companies since 2005 and is committed to continuing education and professional development in dog behaviour and training. Mandy also has a special interest in holistic/integrative veterinary health care and is veterinary nursing part time expanding her knowledge in this area with skilled integrative veterinarians. Privately, Mandy is a passionate supporter of animal welfare reform and for the work of Bali Animal Welfare Association (BAWA). She frequently assists BAWA on the welfare issues they face in Indonesia and is a founding member of BAWA WA. Mandy’s owned by Rhodesian Ridgebacks and her journey with her RR’s over the years has included lots of silly and fun (but very useful) dog training games as well as agility, mountain biking and bush walking. Mandy especially loves her Rhodesian Ridgebacks! Mandy is committed to positive reinforcement and fun training! If your dog is not socialised please consider whether this will be a suitable activity for you both. You may wish to book a one to one lesson first to see how your buddy will take to the water on a sup before participating in this course. You will be fully responsible for your dogs behaviour and we reserve the right to ask you to leave the session if the safety of others is at risk. We ask that you trim you dogs talons to prevent damage to the paddle boards. Contact your local vet for details on nail clipping. It is strongly advisable that you provide a life vest if your dog cannot swim or if you are unsure of their capabilities. You must have basic stand up paddle boarding experience to participate in the course. Full payment is required in advance and you will be required to sign a disclaimer prior to this course. Payment is non-refundable. Credit may be issued in extenuating circumstances. If weather conditions are unsuitable the session may be rescheduled.